Evidence of the very first libraries was discovered in ancient Sumer, with some dating as far back as 2600 BC. Countless awe-inspiring libraries have been built and enjoyed throughout history. Many of those have been demolished in natural disasters, acts of war, or for other reasons. Fortunately for us, people are still enamored with and fascinated by beautiful libraries and the books that fill them. Here are just a few examples of some of the most stunning libraries in existence today. Even people who haven’t read a book in years will be inspired by these gorgeous structures. The Library of Trinity College Dublin offers its services to two universities in Ireland: the University of Dublin and Trinity College. 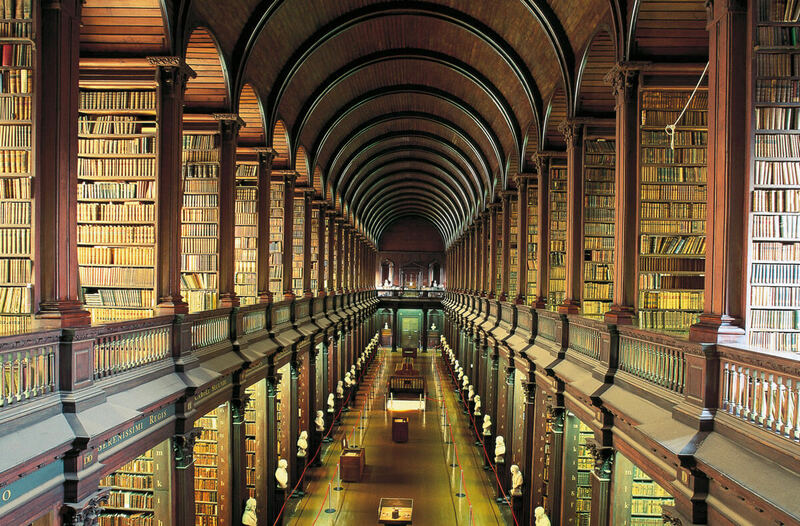 When Trinity College was formed in 1592, the library was also established. This photo depicts the 213 foot-long “Long Room,” which itself houses 200,000 books and numerous marble busts. The harp that served as the model for Ireland’s emblem also can be viewed in the Long Room. There are several popular ghost stories surrounding the library. The fact that Dracula author Bram Stoker studied here as an undergrad probably doesn’t help quell those rumors.